BetOnline has always been synonymous with sports betting, but it wasn’t always a household name among poker players. That changed in 2011 when the big 3 poker sites were pushed out of the United States. In need of a new home, poker players started exploring their options and liked what they saw at BetOnline. 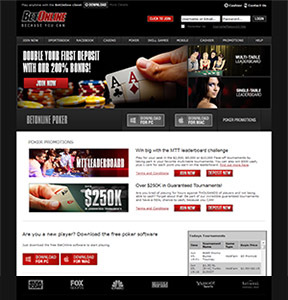 With solid software for Mac & PC, BetOnline has become a great place for the casual poker player. If you’re looking for gigantic guarantees, you’re better served by other sites. But if you’re looking for a place where it’s easy to win, BetOnline’s poker site might be your best bet. That’s because the poker room is popular among sports bettors who aren’t necessarily great at poker. If you’ve got a good grasp of pot odds, you can do very well at the BetOnline poker site. There’s also a decent amount of money to be won with over $150,000 in guaranteed prize money on the line every month. There’s also a series of freerolls that run almost hourly every day, so it’s easy to win something for nothing at BetOnline. There are Countless poker rooms operating online and we give you the credible information to make informed decision where to play. The poker rooms we list on our website have all been approved and endorsed based on our own analysis as well as feedback we receive from our site visitors. The review of these poker rooms is an ongoing process and the criteria we use to formulate the overall rating of each poker room was chosen by the editor as well as feedback we received from the loyal community we have built. We analyze the results of all of our criteria as well as the customer feedback from trusted community members and we issue a final overall rating score. The rating score can remain the same or change over time if a endorsed poker room fails to live up to their expectations.